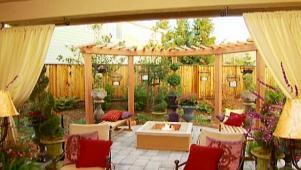 A flower is the color inspiration for a stylish outdoor patio perfect for entertaining. Flowers provide the color inspiration for a stylish outdoor patio. A flower is the color inspiration for a stylish outdoor patio.